At The Stonemasonry Company Limited we think something that sets us apart from other companies is that we can offer our clients the full package for their staircase, meaning we not only carry out the design, manufacture and installation of the stone staircase, but, with the assistance of our trusted third party suppliers, of the balustrading as well. We feel that this co-ordinated approach brings the best results for our clients, the benefits being that the co-ordinated design process ensures all eventualities are considered by our team so we can achieve a more cohesive design, and most importantly it streamlines the project management, as our clients have a single point of contact with us rather than having to organise 2 or 3 suppliers working on a single feature. Our teams use digital technologies to ensure the most accurate survey and the most precise manufacturing to achieve beautiful results, we have found that this overall approach reduces risk and produces a more tailored result for our clients. To help our clients as well as third party suppliers we find that an agreed upon vocabulary is essential. Whether we are talking about one of our more traditional cantilever stone staircases or a more complicated reinforced or post tensioned stone staircase this standard vocabulary allows details to be seamlessly passed from person to person with clarity and efficiency, this document is integral to that dialogue and we hope that you find it both useful and interesting. Balustrade: This is the name describing the whole structure of handrail, spindles and other features altogether, as one item. Handrail: The flowing rail that you hold at the top of the balustrade, usually in wood, but this can also be produced in metal, there are several options when it comes to the aesthetic and feel of this element, classic or more modern moulding, light oak or dark mahogany and everything in between, whatever is most befitting for your home and your staircase. The height of this element is particularly important in the design to ensure a comfortable ascent and descent. Spindle: The name for the many vertical poles that support the handrail, with such a huge variance in ornament, materials, finishes and spacing, the balustrade design is often driven by the spindle choice. Side mounted: When the spindles connect to the side of the staircase, this allows for a wider space to walk on. This fixing method is only usually employed with a specific style of highly decorative cast spindles (such as those pictured, left). As with a top mounted design the holes for the metal elements are drilled directly into the finished staircase. Whilst for manufacturing purposes it means that all spindles will be the same height there are a number of additional design considerations that our team must take in to account, including the weight of these decorative pieces and the spacing. Top Mounted: This is the most common way spindles are attached to the staircase, being vertically attached directly to the tread (As per our illustration below), perhaps with an ornamental feature (Shoe) covering the connection point. The holes for these spindles are drilled directly into the top of the steps once the stone staircase is in-situ meaning the setting out of these holes is a precision exercise. In addition the drilling of the holes themselves can be a challenge, requiring patience from our expert team to ensure there is no damage to the stone. Newel Post: A larger supporting element within the balustrade a newel post is much thicker than the other spindles. The newel post is usually a feature at the beginning or end of the staircase, so it is an important element to the start and end of your journey, both practically and aesthetically. Volute: Sometimes called a Monkey Tail, the spiral shaped decorative feature at the beginning of the handrail. These decorative features are usually supported by multiple spindles (as per the image, left), but can be designed with a newel post. Swan neck: A feature where the handrail rises sharply before flattening out at a horizontal part of the staircase (similar to a goose neck), this feature is usually seen where the stone steps meet the landing, it accounts for the change in height whilst allowing comfort for the user. Ramp: A section of the handrail where the pitch changes, i.e. gets steeper, perhaps due to a tighter curve in the staircase. Pin: For spindles with a square base or large diameter, the base will often have a small pin inset into the bottom which is then set into the stone. 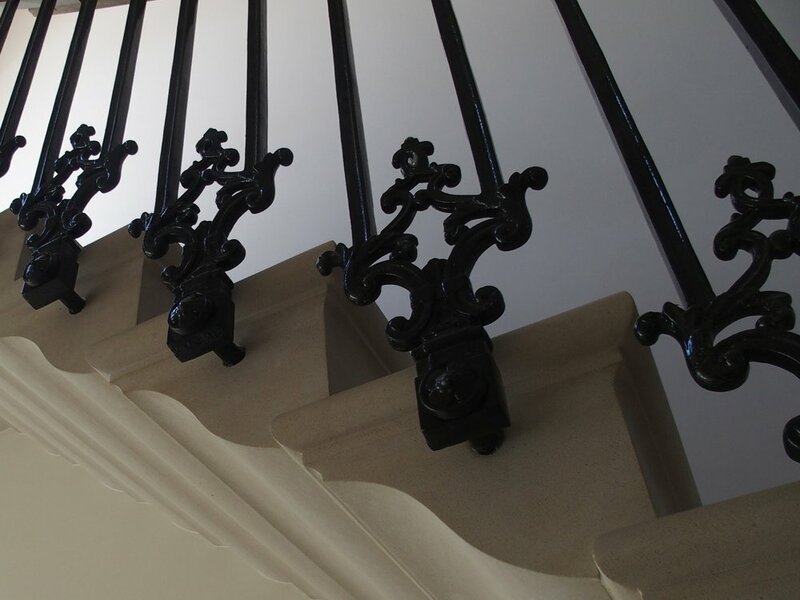 Although an ultimately unseen element it is essential in anchoring the spindles and supporting the balustrade overall. Spindle Embedment: This is the depth that the bottom of a spindle, or its pin, penetrates into the stone. This is calculated based on a number of design features, including the weight of the spindles and handrail. This is of particular importance for our Post Tensioned Stone Staircases as the mechanisms under the surface of the stone step, that support the floating elements, must not be impacted by the drilling, so the embedment and positioning of the spindles is particularly important due to the additional structural considerations. Edge spacing: The distance between where the spindle meets the stone and the edge of the stone step, an important variable when designing a balustrade for a stone staircase because there is a minimum edge spacing to maintain structural embedment. Collar: These are small decorative elements added to certain spindles. These items require special care when it comes to installation, as it is essential that these pieces completely line up (as pictured, Right). Core Rail: An unseen metal handrail of sorts that reinforces the connection between the spindles and wooden handrail, this feature is required on occasion when particularly delicate or slender spindles are used alongside a weightier handrail.